Central Illinois Radiological Associates » Interventional Radiology Clinic » Howard I. Roth, M.D. Brian Ruiz De Luzuriaga, M.D. Dr. Roth received his medical degree from Northwestern University Medical School in Chicago. He completed a one year Internal Medicine Internship from 1983-1984 at the George Washington University Hospital in Washington, D.C. and then graduated from their Diagnostic Radiology Residency in June 1988. The following year, 1989, Dr. Roth completed a fellowship in Angiography/Interventional Radiology at the M.D. Anderson Hospital and Tumor Institute in Houston, Texas. He became a Diplomat of the National Board of Medical Examiners in 1984, a Diplomat of the American Board of Radiology in 1989 and holds a Certification of Added Qualification in Vascular and Interventional Radiology. 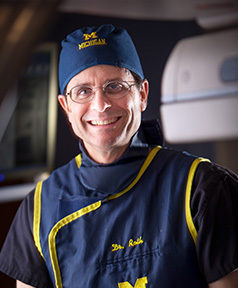 Dr. Roth is a member of the Radiological Society of North America, American College of Radiology, Society of Interventional Radiology and the American Roetgen Ray Society. Dr. Roth is dedicated to research and education and has been the principal investigator on several research projects. He was course director for “New Wave Cardiology” Carotid Ultrasound for the Cardiologist and has co- authored several publications. Dr. Roth joined Central Illinois Radiological Associates October 1, 2007. Keep up with the lastest CIRA news. Convenient centers all across Illinois. © Central Illinois Radiological Associates. All Rights Reserved. Site by Central States Media.